CVA 99-47 – [Group photo of the Corinthians Amateur theatricals]. 1912. Stuart Thomson. VAIW Note: If this image was made in 1912, as asserted, I suspect it was not an amateur production by ‘the Corinthians’, but rather a professional production of The Mikado by a NYC company. If I’m right about that, the theatre where this production was held was the English Bay Theatre (a later incarnation of what was the Imperial Roller Rink at English Bay). I could find no mention in local newspapers in 1912 for any performances by a “Corinthians” theatre group (indeed the only source I found that mentioned a “group of amateurs” by that name indicated that they were an English amateur football team – a soccer team as North Americans today would call it). But my search for performances of The Mikado in Vancouver in 1912 was more productive. There was a professional production in September of that year by Shubert and Brady’s NYC Gilbert & Sullivan Festival Company. 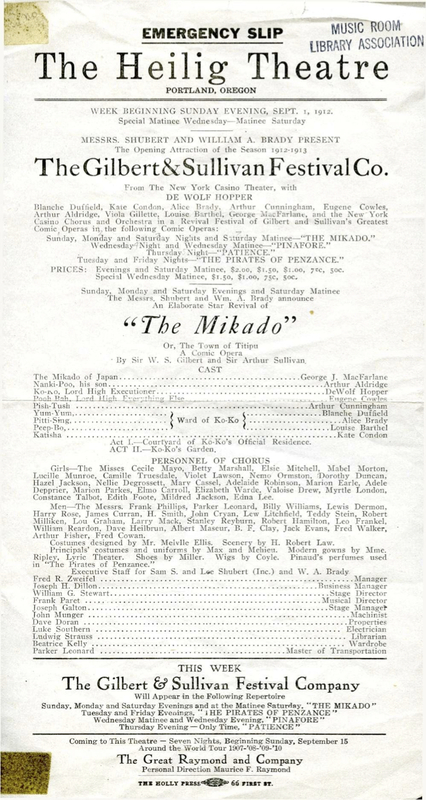 The Mikado (and other G&S operas) was initially advertised to be held at the “Imperial Theatre”, but within days of that initial announcement, the ad copy was quietly changed to read the “English Bay Theatre”. The confusion was likely caused by the introduction of a new theatre in Vancouver which opened at about the same time: the Imperial, located on Main Street. The English Bay Theatre was a short-lived tenant in the former Imperial Roller Rink building (see photo below). The similarity in name between the Imperial Theatre and the Imperial Roller Rink was doubtless the source of the brief confusion in the ads. The fact that G&S productions were held in the former roller rink, instead of in the far more commodious (and theatrically suitable), 1200-seat, Vancouver Opera House, was because the Opera House was closed for renovations in 1912 by the new owners, Sullivan and Considine (the CPR had sold the house in 1909). The closure of the Opera House must have accounted for the moaning in the press by the business manager of the G&S Festival Theatrical Company, Mr. Dillon, about the “distressing conditions” in which the Company would be forced to play. 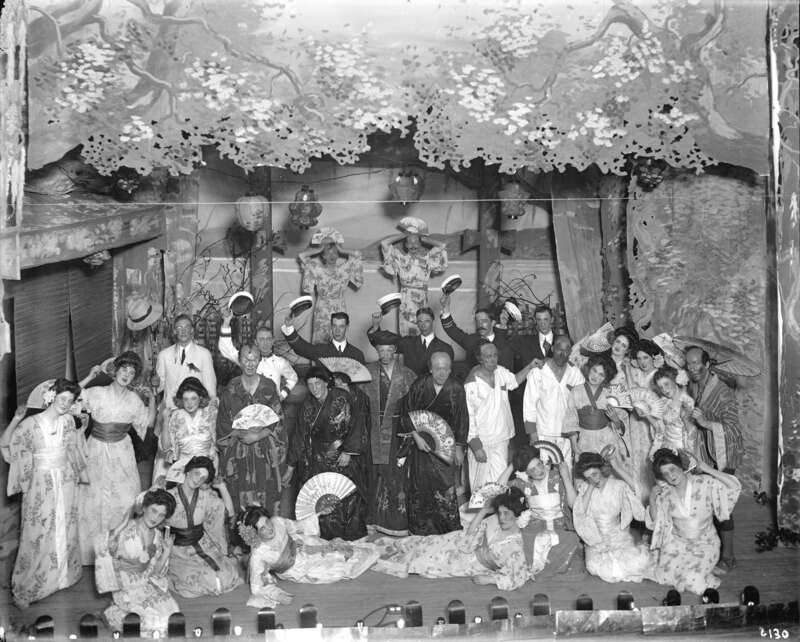 “We will not be able to use a great part of our scenery, but the people will understand the conditions.” The Mikado players shown in the image above, do indeed, seem to be crammed onto a tiny stage. 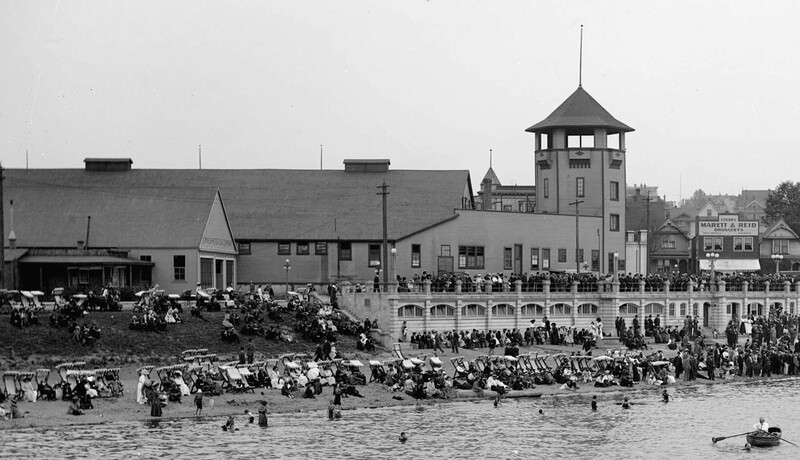 Crop of LGN 467 – [Crowds at English Bay in front of bathhouse and Imperial roller skating rink]. 1909? Richard H. Trueman photo. VAIW Note: The Roller Rink would later become, albeit for no more than a couple years, the English Bay Theatre. The ad for the G&S operas indicates that E. R. Ricketts was the manager of the English Bay Theatre. Ricketts had been the lessee of the Vancouver Opera House (on Granville) from 1902-1912. When the CPR allowed his lease to expire at the Opera House (as part of their plan to sell the house), Ricketts failed to get a new theatre house, at the corner of Pender and Burrard, any further than “the foundations”. Robert Todd notes that “[t]he fall of 1912 found the manager [Ricketts] booking touring companies into the English Bay Theatre, the name he gave to the Roller Rink at English Bay; this was a thoroughly unsuccessful venture, producing houses of only a half and quarter capacity. He soon moved over to the newly built Imperial Theatre on Main St. which the Province reported, would be ‘the home of the best travelling companies until the new opera house is built – some months hence'”**. What was the capacity of the English Bay Theatre is anybody’s guess. But it was plainly substantially less than that of the Opera House. Yes, and no. According the Vancouver Daily World, the production of The Mikado by the American theatrical company was “perfect”. *I am grateful to Vancouver theatrical history guru, Tom Carter, for this insight and for putting me onto the Todd article cited below which confirmed the Imperial Roller Rink as the later site of the English Bay Theatre. ** Robert B. Todd. “Ernest Ramsay Ricketts and Theatre in Early Vancouver,” Vancouver History, Vol. 19, No. 2 (February 1980), pp. 14-23. ***The 1914 productions were Trial by Jury, Pinafore, Pirates of Penzance, and Iolanthe. Multnomah County Library. Program – The Mikado (The Heilig Theatre. Portland. G&S Festival Co. 1912). VAIW Note: This looks like a similar list of cast & crew to that which may have been used in Vancouver in September 1912. The Company was evidently on a North American tour in the autumn of that year. 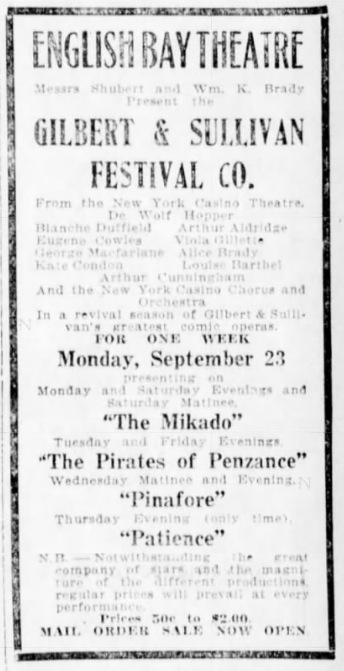 This entry was posted in music, stuart thomson, theatre/vaudeville/cinemas and tagged bc, Corinthians, cpr, DeWolf Hopper, empress theatre, english bay theatre, Ernest Ramsay Ricketts, Gilbert & Sullivan Festival Company, Gilbert and Sullivan, history, imperial theatre, sullivan and considine, The Mikado, vancouver, vancouver opera house. Bookmark the permalink.